Mark Robinson, today, presented a proposal to the NEC 2008 code making council that opens the door to a new energy efficient technology. The proposal was accepted and the new language will appear in the 2008 National Electric Code. For the past 10 years, Nextek power systems has been developing and commercializing Photovoltaic-Assisted Lighting systems. These systems are more efficient than traditional photovoltaic systems because they bypass the inverters and rectifiers traditionally associated with Solar Electric power. In addition, because DC power cannot possibly pass back through the system into the grid, Photovoltaic Assisted Lighting systems are not subject to Anti-Islanding laws. This means that, unlike other solar systems, these do not have to shut down during a power failure. This has a significant impact on disaster-preparedness based systems. In the 2005 National Electric Code, Section 210.6 was changed to protect people who would be changing lamps from exposure to high voltage. The "other than luminaires (fixtures)" prohibited Photovoltaic Assisted Lighting Systems. These systems, running at 380 VDC (the peak of 277VAC), would exceed the 277 volt limit. 1The requirements of Article 210.6(D) are intended to protect non-qualified persons from the risk of electric shock while changing lamps, etc. 2The use of listed electronic light ballasts that provide isolation between the ac or dc power source and the lamp circuit, and protection against electric shock are an alternant means of achieving this intent. 3The proposed new language for 210.6(D)(3) would allow connection of listed, dc-rated ballasts to dc circuits operating between 277 and 600V. Fluorescent lamp ballasts are listed under UL935 which tests for and protects against the potential for electric shock when changing lamps. UL935 applies to both ac and dc powered ballasts. UL1029 applies to high intensity discharge ballasts and has similar provisions for the prevention of electric shock. 4Most electronic ballasts can operate on both ac and dc as the internal electronics converts incoming power to dc before inverting to lamp voltage. Many are listed for both ac and dc use. A ballast connected to a 277V ac nominal circuit will be subject to 392V peak and 431V peak at (+10%) ac high line. The internal DC bus of the ballast will be charged to the same (392Vdc) level whether the ballast is connected to 277Vac or 392Vdc. The lamp is then supplied via an isolated high-frequency inverter circuit. The voltages available in the ballast and the risk of electric shock when changing bulbs are identical. 5The potential risk to a person changing a ballast is a separate issue which is addressed by the new requirements of Article 410.73(G) requiring a ballast disconnect switch: “The luminaire will contain a disconnect means internal or external to itself or the luminaire will be cord and plug wired with UL rated hardware”. Ballast replacement is also an activity normally performed by qualified personnel. 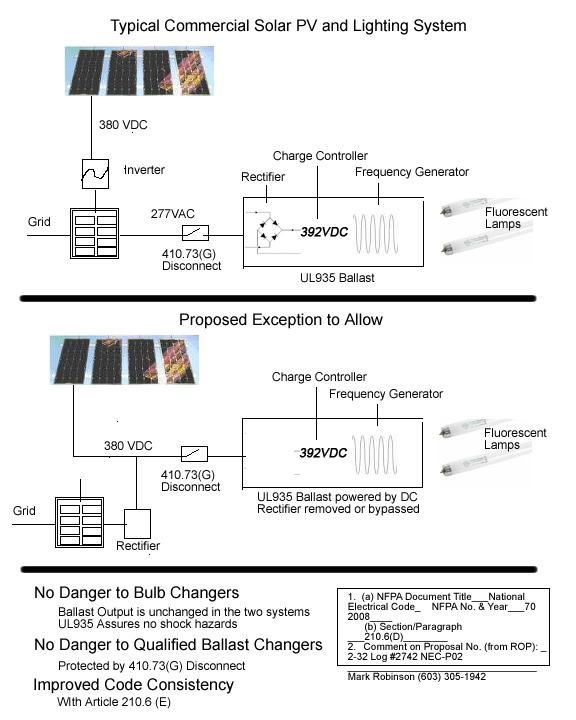 6Comments from luminaire manufacturers (in the 2005 ROP) in response to the changes in the 2005 code that excluded luminaires from operating at over 277V stated that this change was occurring without justification – no problems or cases of electric shock had been reported for lighting systems operating at over 277V. The complete proposal, brilliantly crafted by Dr. Robert Wills, can be seen here. This code change opens the door to a new technology that can be used to improve the efficiency and reliability of Photovoltaic Assisted Lighting Systems.